by Howard Heeley, with background information gathered and prepared by Nick Heeley. 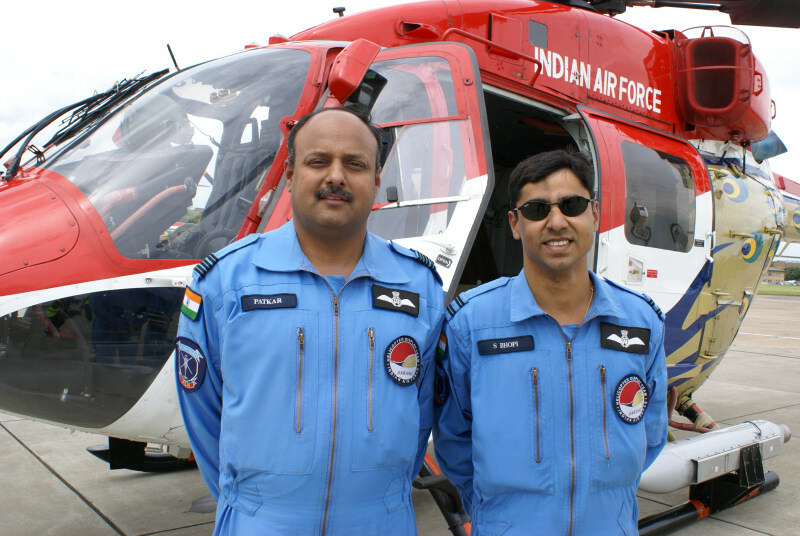 In 2008 the "International" in Waddington International Airshow will once again be truly warranted with another impressive display of flying skills this year due to be provided by the Indian Air Force [IAF] Helicopter Display Team "The Sarang". 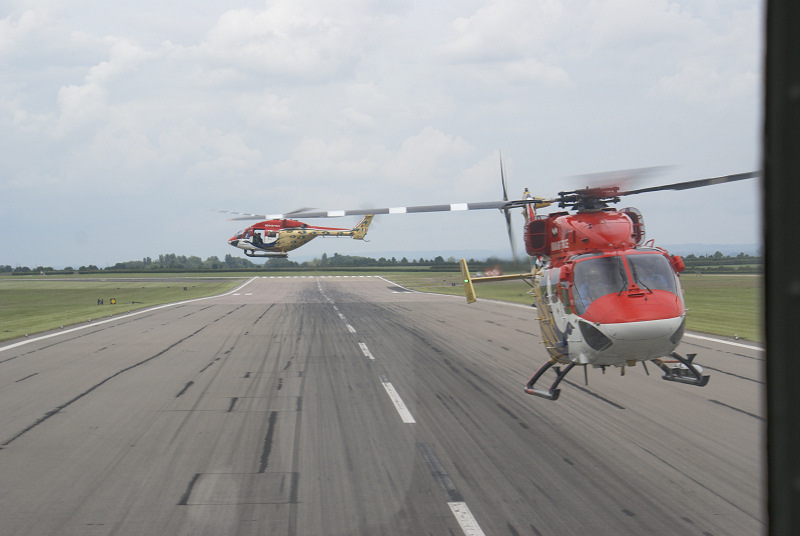 The Sarang Helicopter Display Team has evolved from the former Advanced Light Helicopter [ALH] Evaluation Flight formed at Aircraft and System Testing Establishment [ASTE] at Bangalore on March 18, 2002. 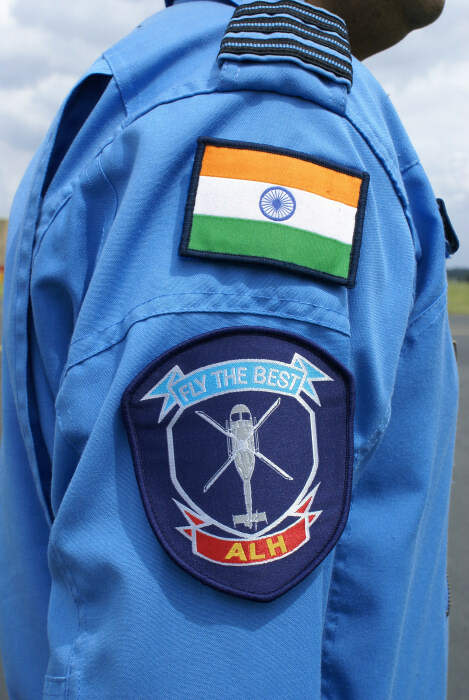 After completion of the initial task of field evaluation of the ALH, the unit's role was changed to formation display with the purpose of showcasing the professionalism of IAF and to demonstrate the giant leap taken by Indian aircraft industry in producing this state of the art helicopter. The Team was rechristened 'Sarang', which is a Sanskrit word meaning Peacock. 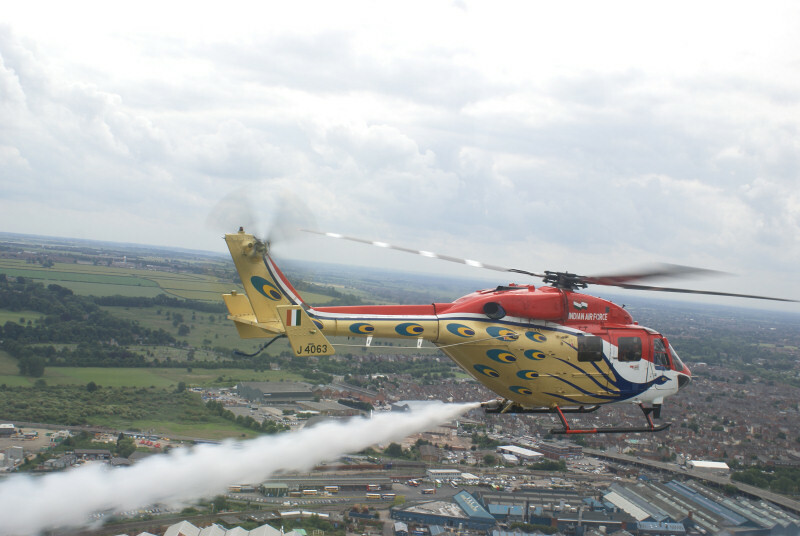 Its manoeuvres symbolise the beauty and grace of the Indian national bird during the display. 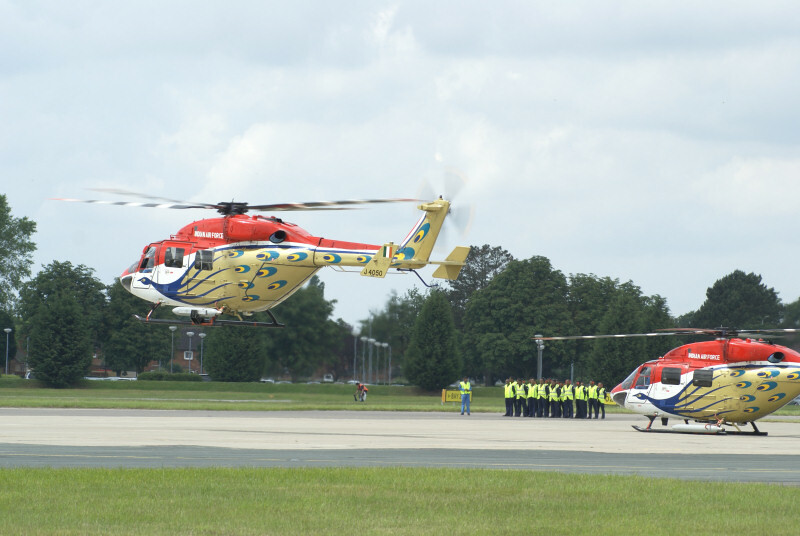 The helicopters have been painted in a unique paint scheme which utilise bright colours with the peacock form superimposed on it. 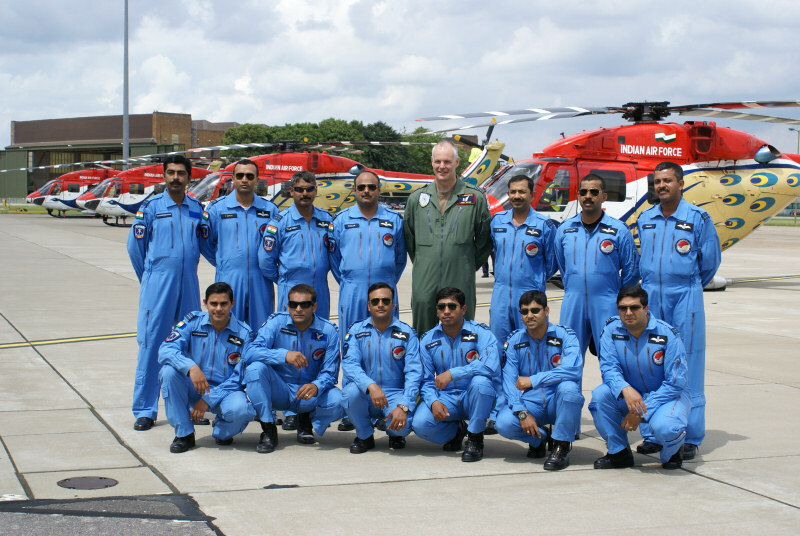 The Team is presently based at Indian Air Force base at Yelahanka near Bangalore, but has been deployed in the UK since early June. 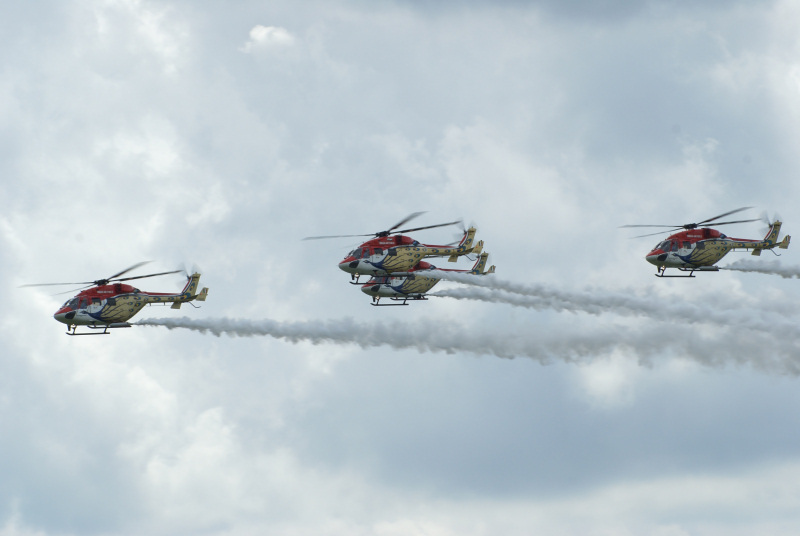 The Sarang with their display profile aims to demonstrate the high capability of the ALH and the true professionalism and exceptional skills of the IAF pilots use to capture the hearts and enthral the audience through rigorous manoeuvring and graceful turns. The team first displayed in 2004 during the Asian Aerospace at singapore and they have continued to grow in popularity since and after their appearance at the Al Ain Aerobatic show in 2005 and they were considered by their contemporaries to be one of the top 10 best display teams in the world, which is a great testament to them showing how their combination of close displays and remarkable skill impress the crowds. They have carried out many displays in their home country such as at prestigious events or air shows as well as those abroad. What is stunning about the sarangs is how the pilots have such great control over the instable helicopter and how they produce such great displays even with the large rotor blades of the helicopters. 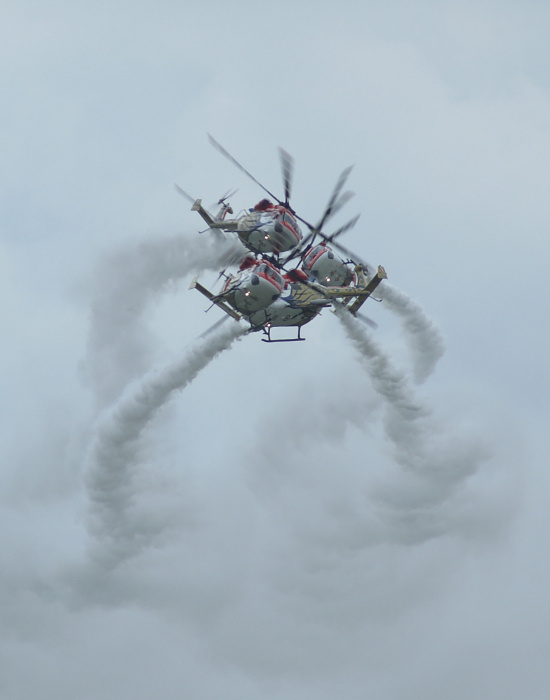 The teams motto: "But for the rotors, we would have been closer" - shows how they continuously strive to make their displays perfect by using steep bank angles, high rate of rolls and pulls ups to create beautiful patterns in the sky. 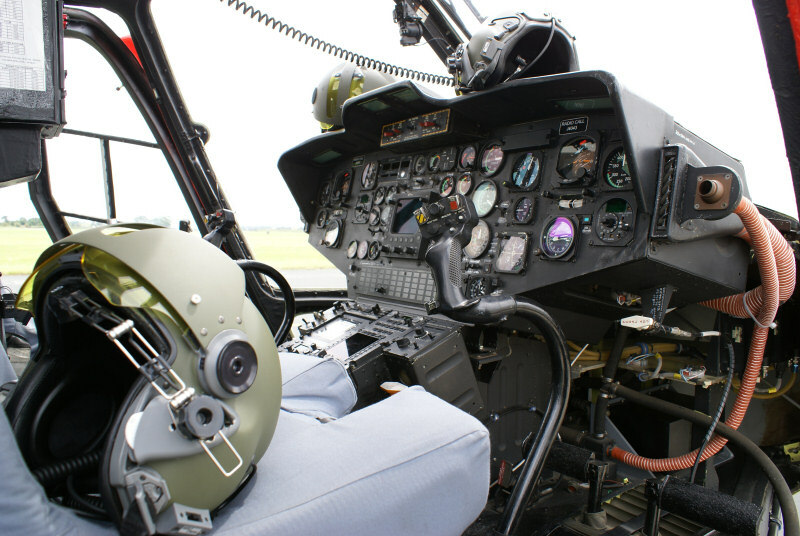 The helicopter used by the sarangs' is the Advanced Light Helicopter or Dhruv. 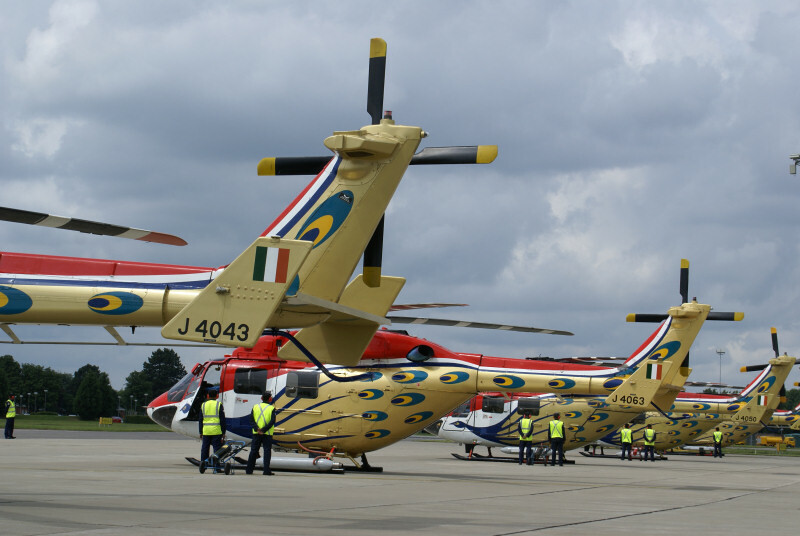 Other than display flying it fulfils a range of roles within the Indian Air Force such as VIP transportation, search and rescue, under slung load carrying, disaster relief work and offshore operations. It is also used for civil purposes such as by the state government and Indian industry. 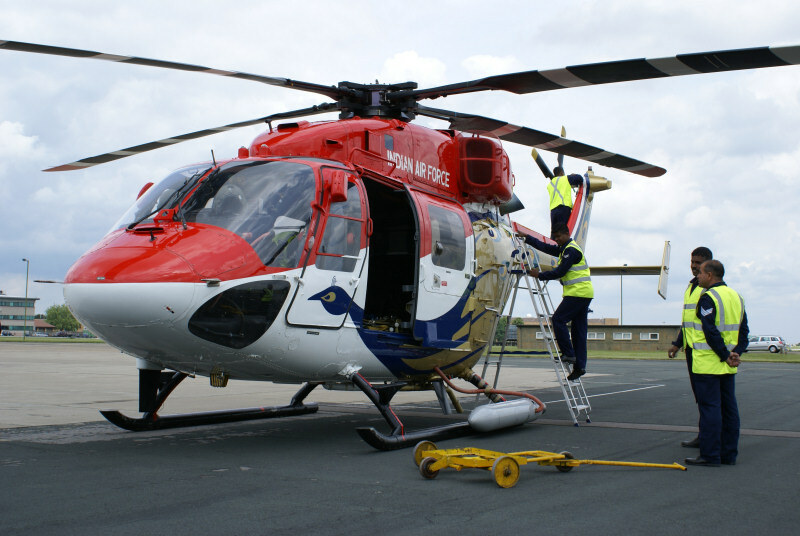 The helicopter which is found in the 5 ton class also has a high cruising speed of 320kmph meaning it can be rapidly deployed to needy areas. Due to the wide range of capabilities it has and its exceptional performance it means it has a competitive edge over its contemporaries and has hence been chosen by the air force. 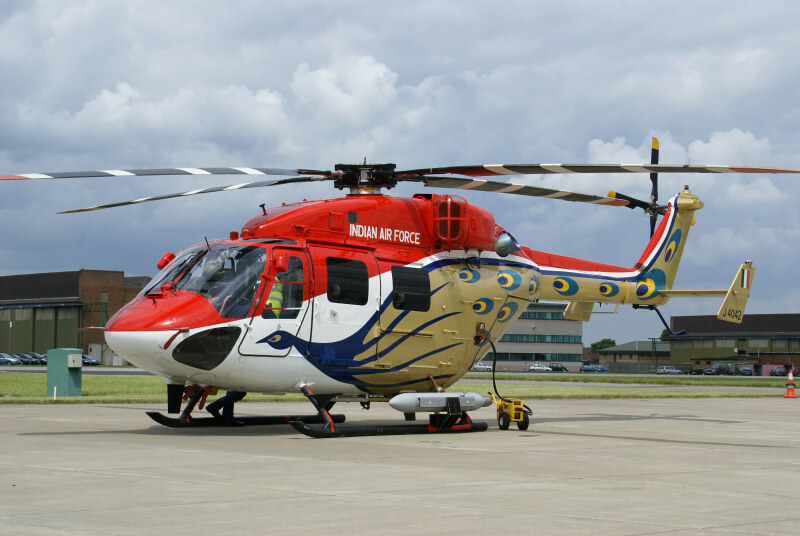 The helicopters are produced by the Hindustan Aeronautics Limited (HAL). They have 19 production divisions in south East Asia and 9 Research & Development centres. 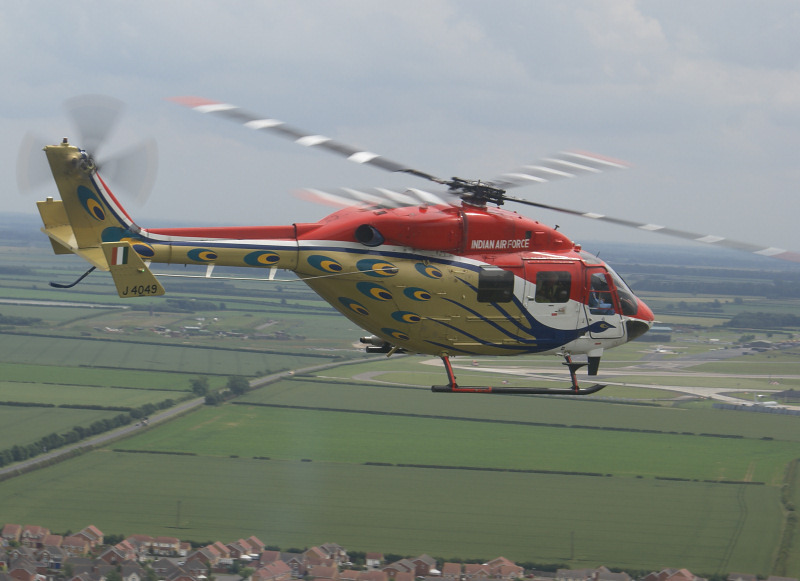 The company performs a wide range of tasks such as design, production, repair, overhaul and aircraft upgrade and they have now started to work with aero engines, as well as on the Dhruv. 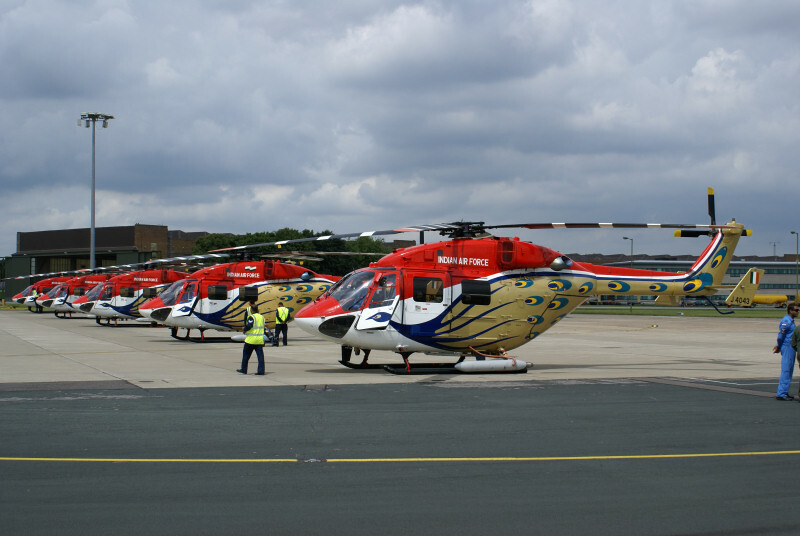 Prior to displaying in UK, the team had travelled thousands of miles across the world to the Berlin Airshow. The team's helicopters had been dismantled and freighted to Germany in an AN-124 with some of the crew travelling on board. The rest travelled by a civilian airliner. They arrived in the UK on 3rd June, having routed through Europe with a stop over in Belgium. 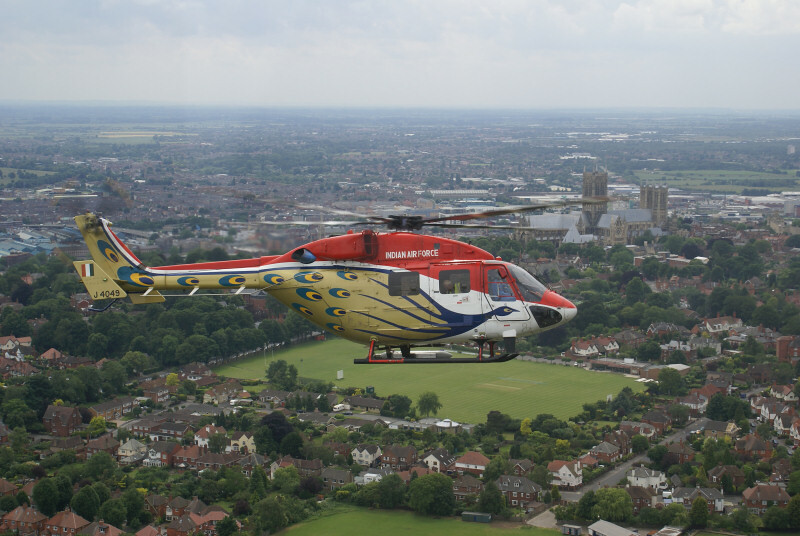 Before they leave the UK they will have carried out 4 displays and the team's helicopters will be dismantled after Farnborough; again returning to India via an AN-124. 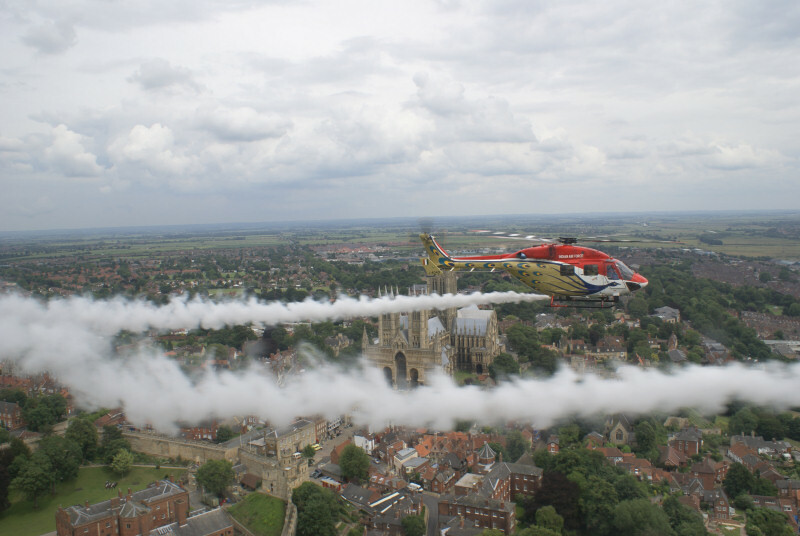 On June 24, 2008 during a pre-Airshow press call at the base just outside Lincoln the sarang demonstrated the precision flying capabilities of their display routine, before then participating in an air to air photo sortie over the impressive Lincoln Cathedral. This iconic Lincoln landmark provided a fitting backdrop for those privileged to participate in the photo shoot and it also gave an even rarer first hand insight into the tight formations held by the team during their display. 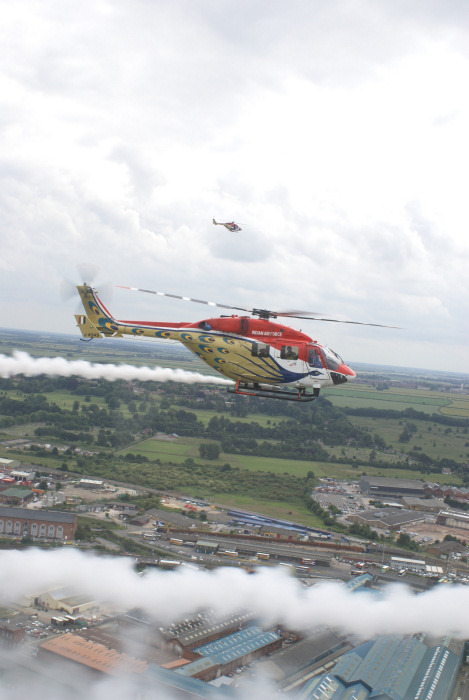 The flights took place after the completion of the display and interview sections of the press call. 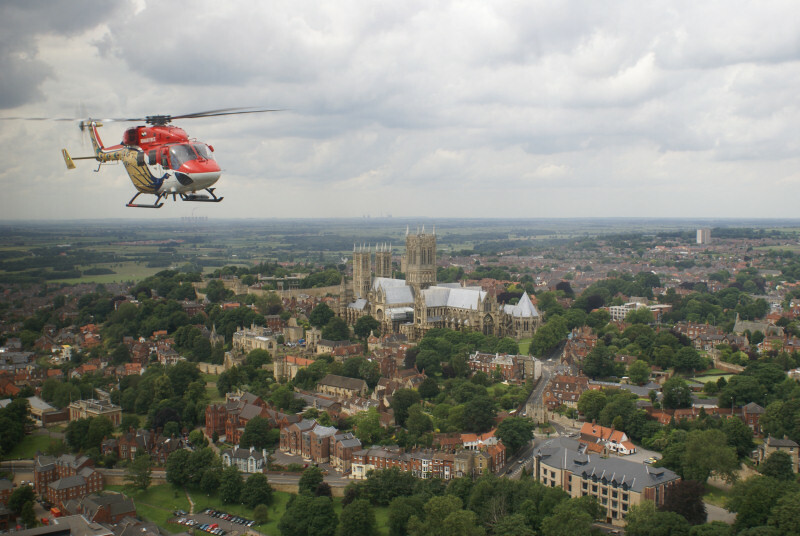 For the flight the two photographers were allocated window seats in each of the four main Team helicopters; whilst local TV crews were taken up in a fifth Team helicopter, with the aim of flying at a greater distance out to capture the full formation as it passed over Lincoln Cathedral. 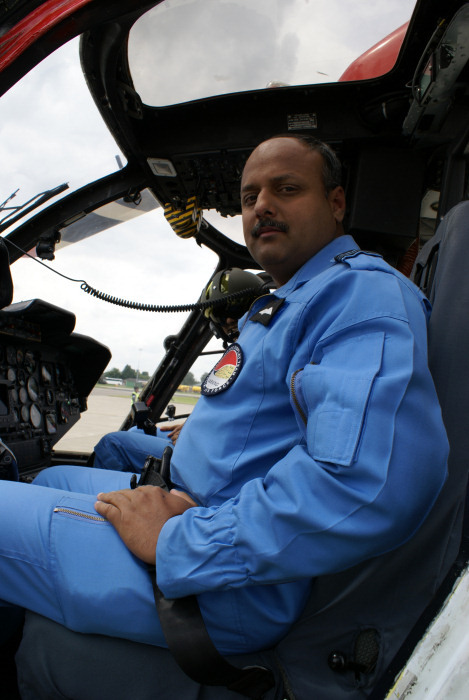 My helicopter was sarang ALH J4050, which was piloted by Umesh D Patkar, the Deputy Team Leader. As everyone embarked on their allocated airframe you could not fail to be impressed by the disciplined approach that was adopted by the ground crew; who having secured their individual helicopters marched off the dispersal to an agreed assembly point. 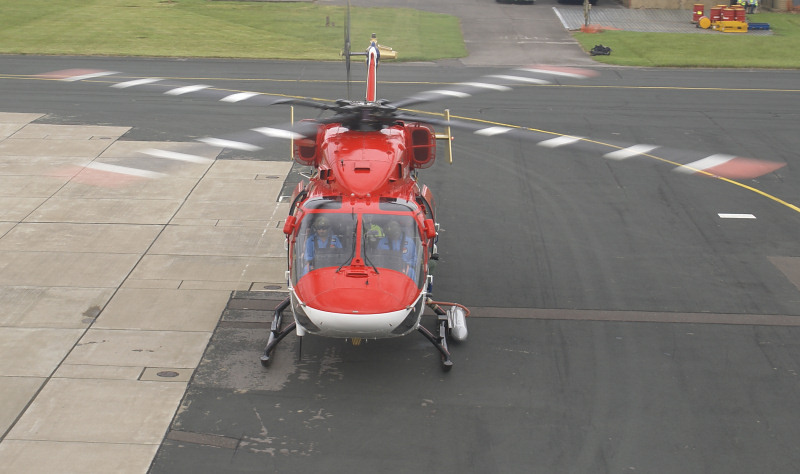 The anticipation grew as the twin engined helicopters powered up their engines and then one by one manoeuvred out onto Waddington's runway lining up for a stacked formation take-off, which in itself was disciplined and impressive. Holding their allocated positions the Team took off in a southerly direction and quickly turned west over Harmston village and began heading in a north westerly direction to a holding point over the former skellingthorpe airfield are to the western side of the city. 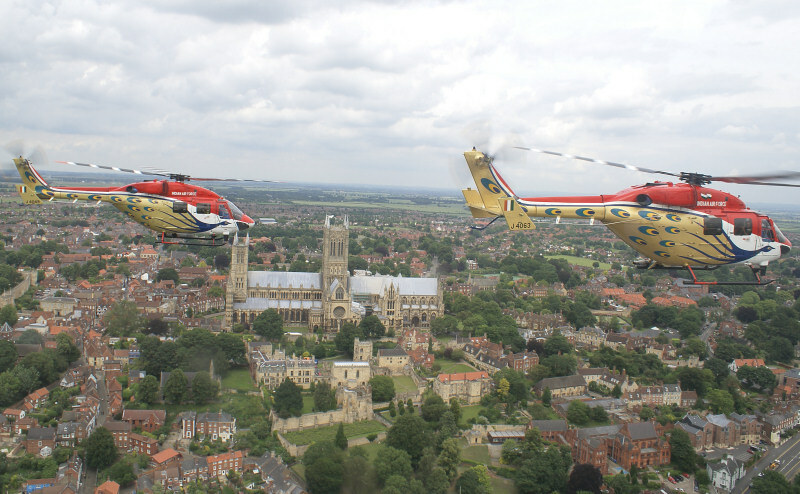 Once in position the Team turned east for a formation run in over Lincoln Cathedral. 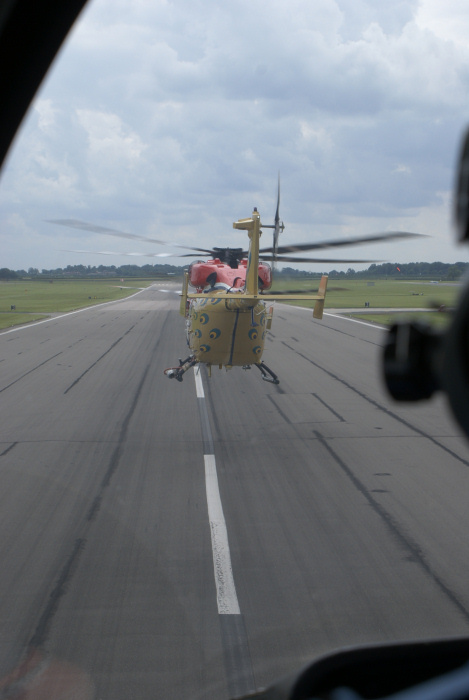 The first pass was very impressive with the individual helicopters sliding into new formation positions as the pass was completed. 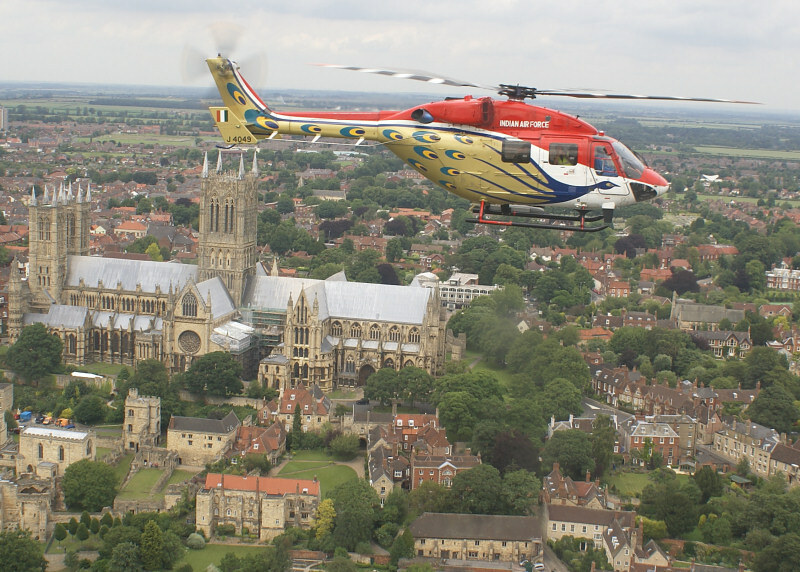 The mere fact of having flown over such an iconic landmark in Lincolnshire's diverse aviation heritage was more than enough for me to take in, but then I realised that we were turning for a second pass. As we approached for a second time two immortal words from another Lincolnshire based aerobatic display team immediately came to mind - "smoke On! ", because as the Cathedral came into view to skid mounted smoke generators were ignited. As we passed over the city for the second time we left a trail of white smoke in our wake, which is an unbelievable sight from inside the ALH. As the run was completed the formation again repositioned itself and we turned again for a final third run. By now I was staring to try and pick out other familiar local landmarks to try and grab those last images. 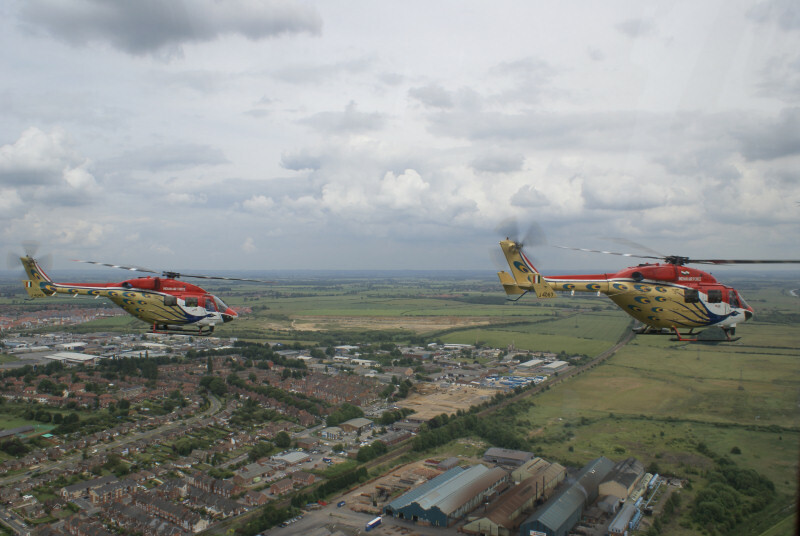 The formation then turned in a south easterly direction to head back towards RAF Waddington but not before passing over several of the city's cemeteries that now house the remains of many former RAF personnel and also over the former Avro factory at Bracebridge Heath. Our approach to the airfield took us over Alpha Dispersal, which houses many of the base's E3 sentry aircraft and close to the Waddington Airfield Visitor Enclosure [WAVE] with the Black Buck Vulcan XM607 standing guard just inside the base perimeter on the opposite side of the A15. 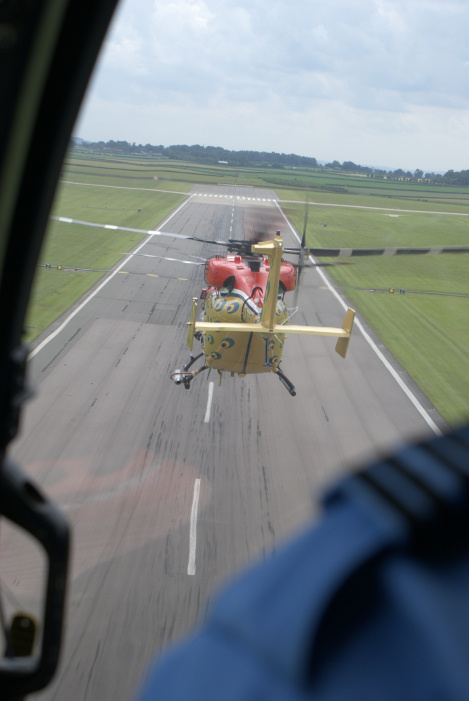 The gentle landing was completed with the same precision and ceremony as the take-off procedure and a wonderful opportunity was nearly at an end. Most of the photographers present had a brief word with their pilots and grabbed some last minute photographs to round off what had been a brilliant experience. 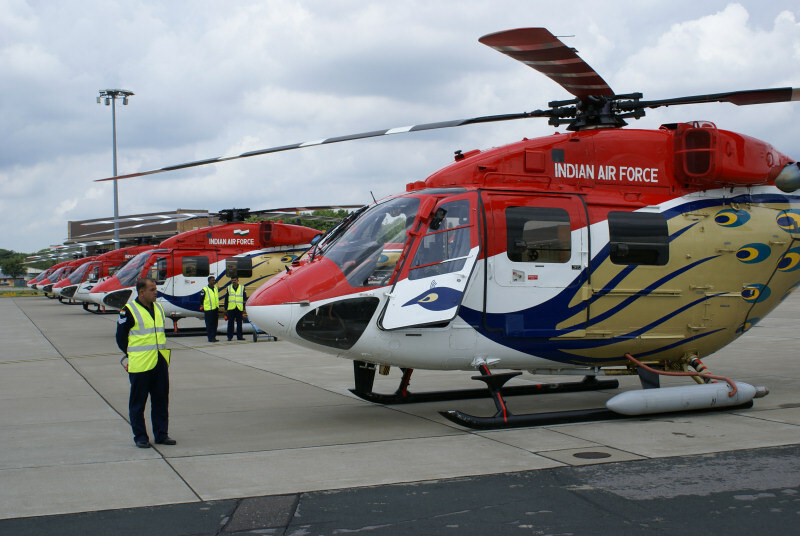 For the last two summers RAF Waddington has been graced with visitors from India, conveniently arranged to coincide with the annual Waddington International Airshow and attracting much attention from the UK aviation enthusiast. Fingers crossed that RAF Waddington can make it three in a row - but what could it be for 2009? I would like to conclude by saying a special thank you to Media and Communications Advisor, Lindsey Harley; the station Commander at RAF Waddington Group Captain A D Fryer BA [Hons] RAF; and the Commanding Officer of The sarang, Wing Commander Misra for an excellent press facility and for providing the chance for the air to air photography.